Quilts Back from Cathy | OccasionalPiece--Quilt! Posted on July 13, 2010 by Elizabeth E.
Always a good day when I can pick up my quilts from Cathy, my quilter. She did a great job. Now on to the bindings! I really like it that you have a quilter. Lately I have been reading a lot about “quilting without obligation.” For awhile I was feeling obligated to learn to machine quilt my own quilts. I’m going to let go of that. 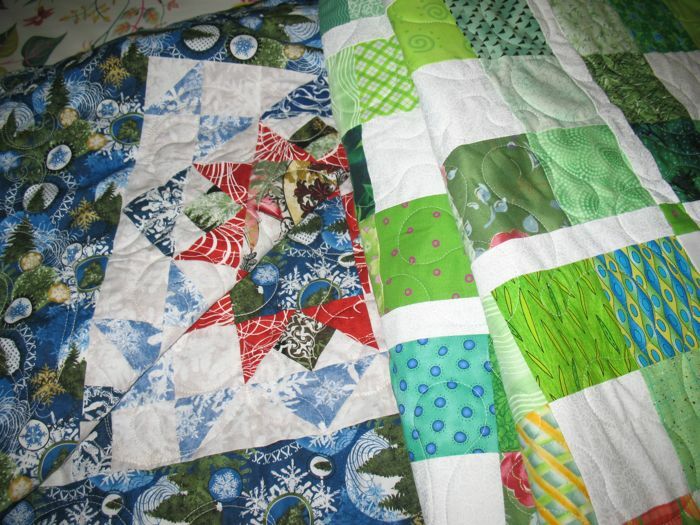 Finish my quilts. Send them off to my favorite quilter and move on to the things I really enjoy doing: making the quilt tops. Whew. I feel better already.